Does your landscape have an area that your irrigation system doesn’t water and you are looking for an alternative to daily hand watering? The Watering Rock may be just what you are looking for. The watering rock is a portable, gravity feed drip system. Each rock holds close to 5 gallons of water. 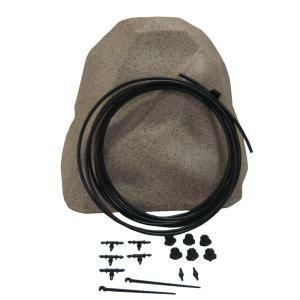 The kit includes 15' of 1/4" polyethylene drip line, 6 adjustable drippers, 5 - 1/4” Tee connectors, 2 -1/4” threaded barbs and 2 -1/4” line stakes. The 5 gallon reservoir will continually release water at the rate you set the adjustable drippers to, until the reservoir is empty. Water and additives are easily added through holes located on the top back side of the rock. Great for new plantings that may suffer from lack of water and nutrients during their initial transplant period. Forgetting to water that sensitive plant, no longer a problem with Watering Rock, place it, fill it, and forget it. The rock will do the rest. Your plants will love you for it.